HomeOwnership Center Has a Heart for Its Community, Sponsors Donation Drive | Elkins, WV | HomeOwnership Center, Inc. The HomeOwnership Center, Inc. is in the business of making home owners, but reaching that goal can be more of a challenge for some than it is for others. During the month of March, the HomeOwnership Center is making a special effort to help people who are facing other housing challenges right now, by sponsoring a donation drive for some of those who may have lost their home all together, at least temporarily. 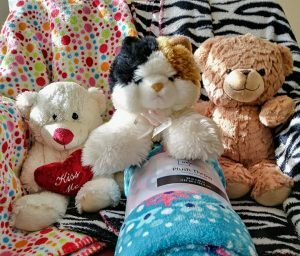 All this month, the HomeOwnership Center, located at 2276 Randolph Ave. in Elkins, will serve as a drop-off point for new (preferably) or gently used stuffed animals and cozy blankets that will be given to individuals seeking help and comfort at Women’s Aid in Crisis, Randolph-Tucker Children’s Advocacy Center and Randolph County DHHR. At the end of March, all the donated items will be presented to WAIC, CAC and DHHR to distribute to the children and individuals who are seeking help from these organizations and need an extra dose of comfort. The mission of the HomeOwnership Center is to strengthen the communities of North Central West Virginia by creating and supporting successful home owners through sound and ongoing financial counseling, home buyer education, and responsible lending. These services are available to anyone, without restrictions. The HomeOwnership Center is located at 2276 Randolph Ave. in Elkins (US 219 North toward the Parsons Road) and is open from 8:00 a.m. to 4:30 p.m. Monday through Friday. For more information, call 304-636-9115. WV Mortgage Broker License #MB-20182; NMLS ID 362854.